My wife and I have embarked upon and are now fatally committed to a difficult, sometimes heart-rending task: we are culling our books. There are thousands of them, distributed on shelves throughout the house and stacked in the shed in boxes some of which were closed, sealed and labelled 25 years ago. Many of those boxes have been as nomadic as we were — London, Lara, Little River, Anakie, Emu Flat via Clare — and, like us I guess, are a bit battered, threatening to come apart at some seams and, well, not to put too fine a point on it, older. The less travelled boxes have simply sat in this or that shed, submitting mutely to move after move, waiting their hour. And that hour has come. Amid volcanic explosions of dust and the accusatory, rending sound of long-sealed tape being ripped from ancient cardboard, the literary treasures are revealed — except that 'treasures' is pushing the definition a bit. What on earth possessed us, you wonder, either to buy, accept or keep Methods of Book Design? It emerges from its long exile into a world when the book and its design are bloody nearly dead. Or The British Way of Life, just on 60 years old and chronicling an England long gone and spectacularly further dismantled only weeks ago. Or Architecture for Beginners? We were never architectural beginners, our structural monuments in various places being confined to a few chook houses and the odd, slightly off-square garden shed. Then there's Coming of Age in Samoa (or, as S. J. Perelman memorably added, 'Growing up in New Guinea or whatever the hell I was doing when I was 18'). A Writer's Notes on his Trade and A Bibliography of Anglo-Irish Literature fall uselessly from the same chaotically spilling box adding more intrigue to the mysterious book buying past. Confronting the shelves inside the house is no easier. 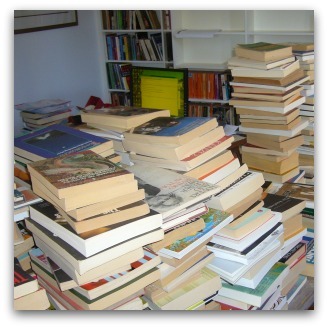 There are many books here that one or other of us — but rarely both — want to keep, yet decisions must be made and the cull must be ruthless. Speaking for myself, I know who to blame, who set me on this path that would land me in front of heavily populated shelves of books, torn wretchedly between this one and that one. It was Mrs Murphy. As a small boy, I lived in Havelock Street, St Kilda: down one end of our street, you came to a wide, almost European looking square which sat well with the cosmopolitan aspect and shops of Acland St. The square opened on to the Esplanade and the wide flat waters of Port Phillip Bay. All of this was presided over by the mad, half-jolly, half-sinister guffaw of Luna Park. In my boyhood days, there was one bookshop in Acland St, the books in which were either interestingly graphic about the mysterious female body (which, however, remained deeply mysterious because annoying small forms of life like me were chased out before we could get a really good glimpse of the various creases, folds and curves that so puzzled and excited us), or were in various foreign languages. The other end of Havelock St was even less promising bibliophile territory. First of all there was Barkly St — legendary haunt of infamous violent luminaries of my childhood, like 'Redda' Lewis, George 'the Butcher' and Pretty Dulcie Markham. And then there was Grey St, which was well named: it seemed always cocooned in a cloud of smoke from the Council Dump and thick black exhalations from the big green buses that trundled off to the Government Aircraft Factory at Fisherman's Bend. There were only two good things in Grey St: Smith's pastry shop was one of them. As an altar boy at the Sacred Heart Church I would repair to Smith's most mornings with a street-wise deceptively cherubic looking fellow server. We would 'do' the six o'clock mass and then — funded by his largesse, since he always had money and I never had any — we would have two custard tarts and cream each at Smith's. The other good thing in Grey St, and the one that certainly made a profound and lasting impact on my life (even if that's not the way I necessarily would have seen it while in mid-custard) was Mrs Murphy's Penny Library, which had about 200 books. I became a fully paid up member when I was about nine years old. I immediately read all her Biggles and all her Williams and borrowed both Encyclopaedias and it is to this crucial and formative membership that I confidently attribute my subsequent literacy. Thus, it was at Mrs Murphy's Penny Library that I began the habit which has caused my present agonies so many years later. Mrs Murphy is long gone but, like Julius Caesar's, 'her spirit walks abroad', her minatory gaze reproves and threatens as the culling hand wavers with indecision, and ruthless determination is enfeebled by sentiment and the tug of the past. Dear Brian, I have no words to express the emotions your piece stirred in me. Would you accept a small tear? Thank you Brian for your great article. I've been given fresh courage to go on culling to be prepared for the dread "down-sizing" where it would seem that anything more than one small bookcase of books is frowned upon. Oh come, come! 'Coming of age in Samoa' I never had to own, being a librarian. But i must have read it appreciatively and with interest at least twice! and have good memories of it. I would cull it now, however, but reluctantly - good luck! All I can say after reading your beautifully weaved article and being a book worm myself is thank God for Mrs Murphy. I won't, thus, send you a book. Your beautiful story is that of many. Onya. Thank you Brian for a wonderful article. We are not alone. I contemplate with dismay my own literary accretions of 70 plus years and those of a 90 year old aunt who has bequeathed her collection to me. My only cause for joy is that my next 3,000 books can now be stored on a single electronic reader no bigger than a small note book. My kids can worry about the lot when the time comes. the coast is jagged like a weeping cut .. the high end of town, pizza beer dusk ... it is here we have staked a life, counted off the steps and measured what it is we need ... hands dissolve in prayer.